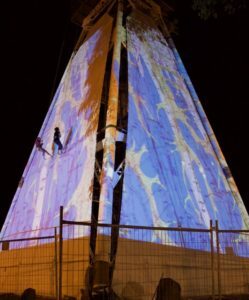 As you will see from the photo thanks to our 3 wonderful, creative, Natimuk riggers, we ha ve been rehearsing with 2 out of the 3 ‘skins’ up. To make up the aerial performance team, along with the 3 experienced aerialists, we are training 3 young local people from Central Victoria. They are coming along in leaps and bounds – literally. Check out footage of one of their rehearsals this week. The project got a great write up in Melbourne’s Broadsheet publication so just follow the link if you want to read an engaging comprehensive wrap up of the aerial work, the training, the ACT Natimuk artists and the project. 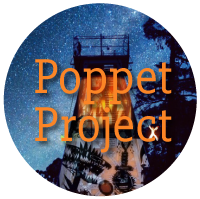 Point of interest: given the shape of the Poppet head all the projected images and indeed the projectors themselves will need to be in ‘profile’ aspect.